A NASA-funded study indicates that an intense asteroid bombardment nearly 4 billion years ago may not have sterilized the early Earth as completely as previously thought. 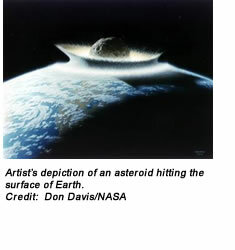 The asteroids, some the size of Kansas, possibly even provided a boost for early life. The study focused on a particularly cataclysmic occurrence known as the late heavy bombardment, or LHB. This event occurred approximately 3.9 billion years ago and lasted 20 to 200 million years. In a letter published in the May 21 issue of Nature magazine titled “Microbial Habitability of the Hadean Earth during the Late Heavy Bombardment,” Oleg Abramov and Stephen J. Mojzsis, astrobiologists at the University of Colorado’s Department of Geological Sciences, report on the results of a computer modeling project designed to study the heating of Earth by the bombardment. Results from their project show that while the late heavy bombardment might have generated enough heat to sterilize Earth’s surface, microbial life in subsurface and underwater environments almost certainly would have survived. “Our new results point to the possibility life could have emerged about the same time that evidence for our planet’s oceans first appears,” said Mojzsis, principal investigator of the project. A growing scientific consensus is that during our solar system’s formation, planetary bodies were pummeled by debris throughout the late heavy bombardment. A visual record of the event is preserved in the form of the scarred face of our Moon. On Earth, all traces of the bombardment appear to have been erased by rock recycling forces like weathering, volcanos, or other conditions that cause the crust to move or change. Surface habitats for microbial life on early Earth would have been destroyed repeatedly by the bombardment. However, at the same time, impacts could have created subsurface habitats for life, such as extensive networks of cracks or even hydrothermal vents. Any existing microbial life on Earth could have found refuge in these habitats. If life had not yet emerged on Earth by the time of the bombardment, these new subsurface environments could have been the place where terrestrial life emerged. NASA’s Astrobiology Program’s Exobiology and Evolutionary Biology Program and the NASA Astrobiology Institute at NASA Ames Research Center, through its support of NASA’s Postdoctoral Program, provided funding for this research. The Astrobiology Program supports research into the origin, evolution, distribution, and future of life on Earth and the potential for life elsewhere.